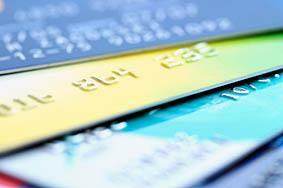 AT&T offers credit cards through its financial partner, Citibank, to consumers with excellent credit. Cardholders can take advantage of the 0% introductory APR for 15 months to rapidly reduce transferred debt balances. In addition, the statement credit system is offered as a perk free of charge since there is no annual fee. Reviewers from Card Hub were unimpressed with the card because it does not offer a cash back rewards system or discount to new customers looking to save on the purchase of a phone by enrolling in the program. In addition, some longstanding customers had a difficult time getting the interest rate lowered. If you frequently purchase AT&T products and services, you can receive up to $350 per year in statement credits with the AT&T Universal Savings and Rewards MasterCard. Cardholders receive 10% toward a statement (5% in subsequent years) for the aggregate amount of AT&T expenditures equal to non-AT&T purchases. This card also offers ThankYou Rewards that are earned by using your card. As an introductory offer, you can earn 10,000 bonus points if you spend at least $500 in the first three months. Cardholders also have the opportunity to accumulate up to 50,000 points per calendar year, and every dollar spent on non-AT&T purchases earns one point. Points come at no cost to the cardholder since there is no annual fee and can be redeemed for various items, such as travel accommodations, gift cards and electronics. Unfortunately, this card lacks enticing offers for those who do not patronize AT&T's products and services, as noted by a review from truefin. Each subsequent dollar spent on non-AT&T purchases is equivalent to one point. Cardholders can accumulate up to 50,000 points per year. AT&T Universal Card account holders always have access to a multitude of free benefits. You have the option to select your statement date and personal identification number. Manage your card online and order additional cards for family members free of charge. At the end of each year, cardholders receive an annual Account Summary organized by month and category to help them gain a better understanding of actual spending patterns. This card also offers a variety of travel perks to cardholders, such as auto accident travel insurance, auto rental insurance and travel assistance services (including medical and legal referrals). For purchases made with the AT&T Universal Card, cardholders are covered in the event that theft or accidental damage occurs with the extended warranty of up to one additional year and retail purchase protection of up to $1,000. If you frequently purchase AT&T's products and services, this card can be a good choice because it enables you to save a nice sum of money through the statement credits. However, if you do not fall into this category, this card may not be for you as there are other options on the market with more competitive introductory offers and rewards systems.